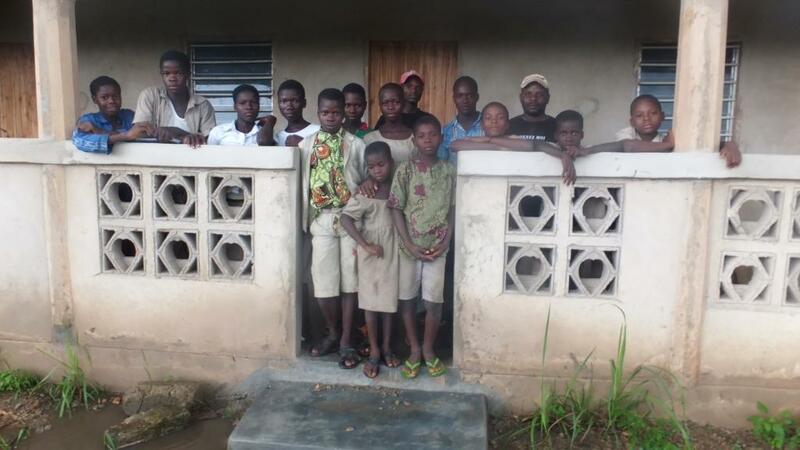 June 20th 2017 – We just received a long e-mail and urgent prayer request from Pastor Sika regarding the Joseph Project Orphanage in Sika-Kondji in Togo. 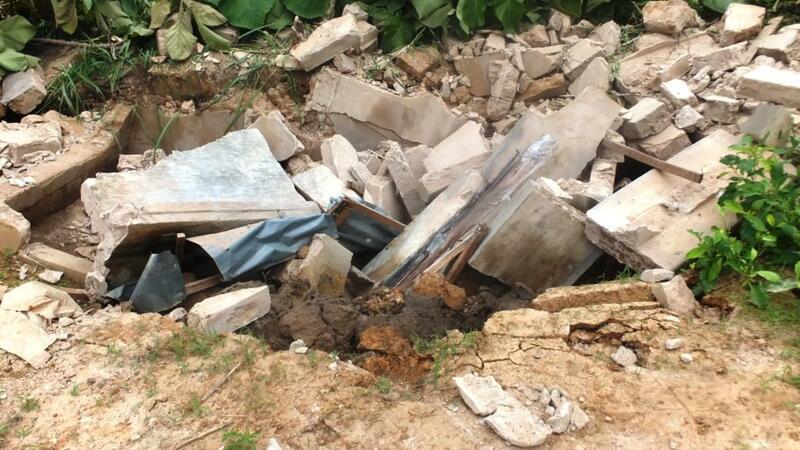 He just returned from a visit there and says that after a recent bad storm and some flooding during this particularly wet rainy season, the orphanage has suffered the complete destruction of the block housing the bathrooms and toilets! The children are reduced to having to go into the bush to use the bathroom – which is very dangerous with snakes and other wild creatures. Thankfully this happened while they were all at school and so no-one was injured, but obviously it has become an important priority to build new bathrooms. Like the other original buildings, the bathroom block was built of local mud bricks exactly 6 years ago. Sadly, due to heavy rain and flooding during the rainy seasons, the building was obviously weakened. This has been a particularly wet rainy season so far – you can see the water in puddles in the photo above, where the children are standing in front of the new building. 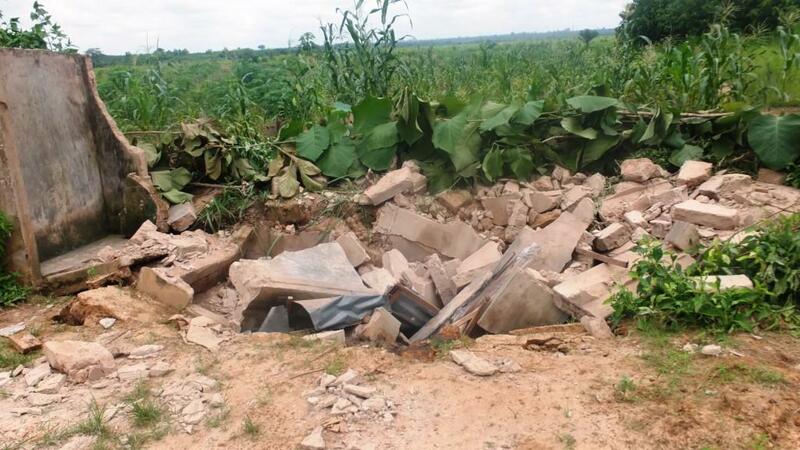 Pastor Sika says that it will take $1,000 to build a new bathroom block, this time using a foundation of reinforced concrete to avoid any future problems. We have just sent him funds for the regular monthly support, but did not want to wait another month to share this in a newsletter. As you know, we pass on 100% of all donations as quickly as possible as we know that there are always more needs and we are all trusting God to somehow “make up the difference”. Please pray that He will do just that quickly with this great need, and contact us if you would like to help! 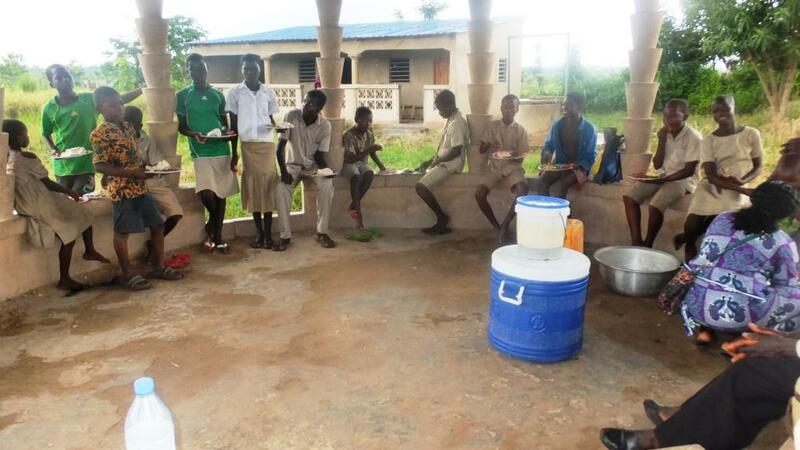 In this photo you can see the orphans sharing food after school, with the new building in the background. Unfortunately this still lacks paint and a ceiling (totaling $535) as recent extra funds had to be used for some orphans who were sick, and to help Pastor Tomety (the overseer of the orphanage and pastor of the church inside the compound) whose family had serious financial need as his children were sent home from school for lack of paying school fees. The final photo shows Koffi and Angele Tsalou, a brother and sister who lost both parents due to AIDS. 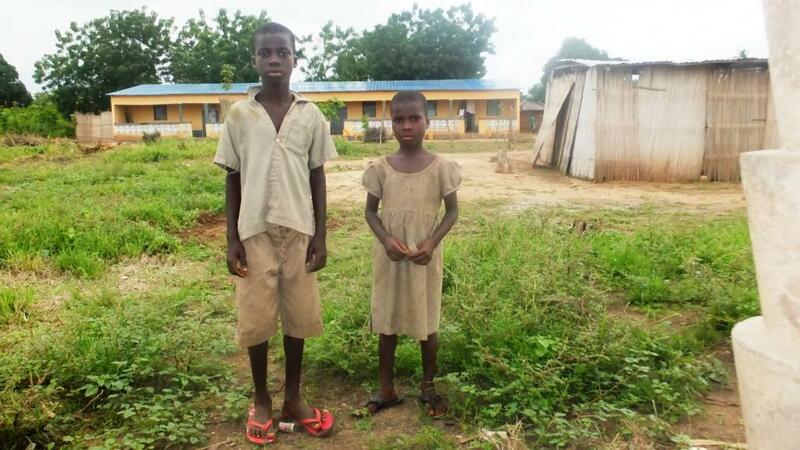 They were recently taken under the care of the orphanage as both children are positive for HIV and have no-one else to help them. With a total now of 18 orphans, the need for food, health care, clothing and school fees/uniforms etc, requires about $1,000 per month now. Sadly we have only been averaging about $500-600, apart from special donations for the building. We ask your continued prayers and support as this important ministry and outreach continues to grow. Thank you.